Mercedes are “out to win” this year’s championship rather than defend their crown, according to senior personnel and two-time World Champion, Lewis Hamilton. They are aware that the opposition – particularly given that in-season power unit development has been allowed – are likely to be making significant gains in performance to catch them. F1 can change very quickly and the seniors at Mercedes know all too well of this. Improvements have mainly been made within the car to keep them at arm’s length although there are a number of aerodynamic tweaks that have been beneficial. Both drivers have confirmed that there is more downforce on the new W06 than last year’s dominant car, although Jerez is not really the ideal place to be making comparisons given its unique track surface and cool temperatures. Starting with the most obvious change, Mercedes have gone for a short nose tip to keep the neutral section of the front wing in aerodynamic play. This means that the front wing pylons have to be tucked into a narrower position, but the main cross section of the nose has a greater influence on how downforce is produced over the rest of the car. You can see how they have achieved this design from the illustration above. As the rules state (see here for more details), two unique cross sections have been made 50mm and 150mm behind the nose tip, each meeting their respective area requirements. A chin has been formed beneath the nose to accommodate the 20,000mm2 cross section and keep the nose tip at the maximum 220mm height above the reference plane. Having this chin pushes airflow underneath to create a venturi effect, generating front downforce. It also navigates cleaner airflow successfully onto the splitter and maintains the position of the Y250 vortex running in parallel with the car centreline in comparison to a long nose. Mercedes have managed to retain their clever camera pod design, mounted on ‘horns’ (or handlebars, ears… whatever you want to call them!) to manipulate airflow smoothly over the top of the chassis. Other teams have also copied the solution despite the FIA’s best attempts to negate them. A rule was made to prevent bodywork breaching a line made between the top of the front bulkhead and the nose tip. You will note that these camera pods seemingly breach this imaginary line – but they are entirely legal. This is because the horns are not actually counted as bodywork within the regulations, so nothing has really changed from 2014! Elsewhere, the front wing is the same specification that they ended 2014 with so I would expect that to change either for the next test or most certainly the final test. The horizontal vanes on the endplates have, however, been repositioned to a much lower position and lie at a shallower angle. 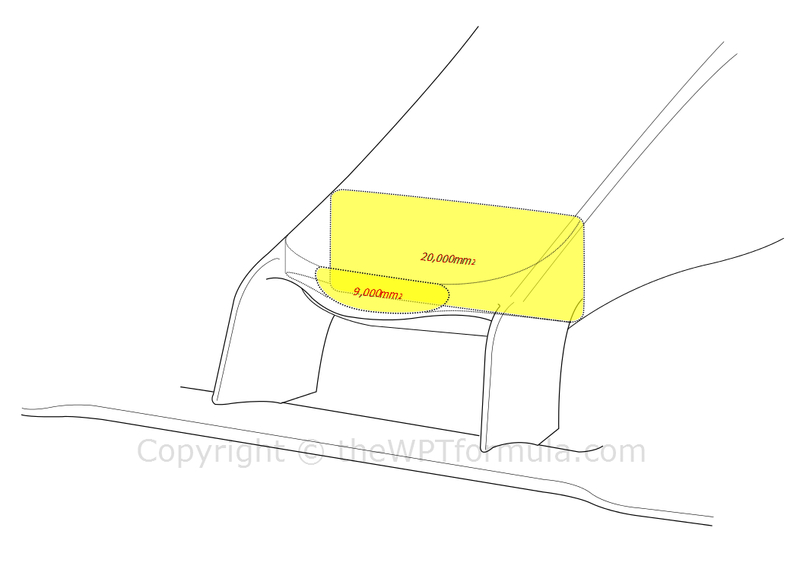 This will be to do with how the low pressure they create is aligned with the trailing edge of the wing in order to pull air out from behind and around the front tyre. Having chopped and changed their under-chassis turning vane throughout last year, Mercedes have decided to at least start 2015 with a four element design to control the Y250 vortex around the sidepod. The pushrod actuated front suspension keeps the striking uni-body lower wishbone that a few teams have copied for this year, of which connects to brand new brake ducts. 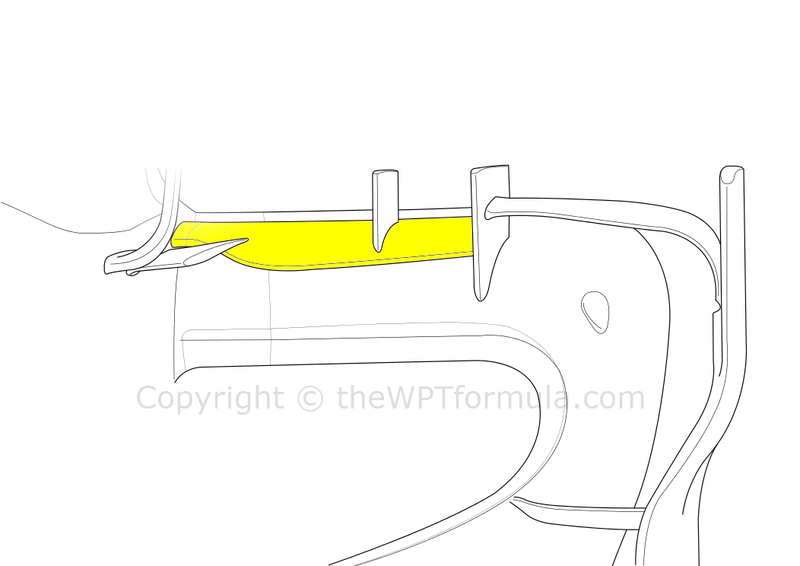 These ducts see a return to pre-2014 design with no inlet scoop visible on the outer face of the large guide plane that wraps around the front tyre. Instead the inlet lies in between the tyre and the plane, which makes for much cleaner airflow passing around the inside of the wheel. On the outer face of the guide planes lies a low-hanging curved vane, as it was last year. These pick up airflow from the front wing and send it behind the front tyre to displace their wake away from the sidepod. There are further flick-ups and vanes near the suspension pickup points, vorticising any flow in this region for safe navigation. The bargeboards, ‘bat wing’ ground speed sensor and splitter have been carried over from the W05, as have the wing mirrors and associated airflow conditioning devices. Above the more sculpted and undercut sidepods lies a new device for Mercedes. A horizontal vane now connects from the outer VG (vortex generator) to the cockpit side, whilst an additional VG has been placed on top. These vanes help downwash over the sidepod with the VGs vorticising any stagnant flow on the shoulder. The vertical vanes that flanks the sidepods to deflect front tyre wake are identical to last year and also join to the outer VG. Whilst the sidepods remain similar to last year, the airbox and the engine cover have been extensively reshaped. Gone are the small inlet airs that sat either side of the roll hoop and in their place is just a bigger, split airbox. The lower inlet will feed the turbocharger and the upper to the gearbox oil cooler that lies along the spine of the car above the gearbox itself. The roll hoop is now only supported by a small stay at its base rather than the two thick pylons of last year. It is clear that Mercedes have been able to package this area more effectively in the W06 as the engine cover is more sculpted around the internals, forming a more pronounced shark fin. 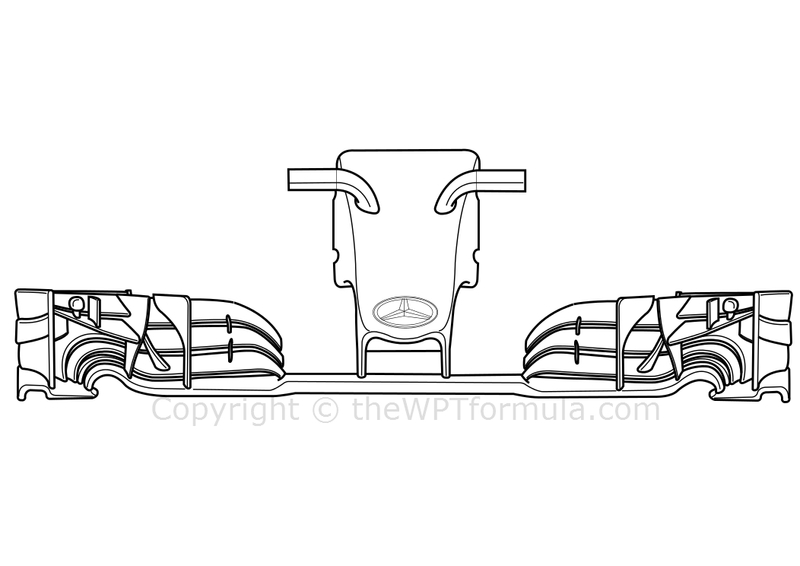 Like the W05 there are also two ‘nostrils’ that vent hot air out of the engine cover around the gearbox oil cooler, placed lower down to meet the more compact packaging. The rear suspension is a carryover from the W05, although the lower wishbone’s leading arm features an intriguing curled fairing. They are able to achieve this within a certain length of the rear tyre before it becomes illegal bodywork. I’m not entirely sure of its purpose but it looks like it sets up a small low pressure region behind to pull air up from beneath – just a guess. At the rear of the car there is little to talk about. In fact the only notable difference between the W06 and W05 is the much deeper cut rear crash structure which will save a decent amount of weight. The rear wing is (so far) the same specification as last year, as is the Y100 winglet that lies above the exhaust. There are no detail changes around the diffuser, either, so I expect a lot to come in this region. Overall this is very much an evolution of one of the most dominant cars in F1 history. With Mercedes expected to make an additional 50bhp thanks to higher pressure fuel injectors (new from Bosch, running up to the full 500 bar permitted by the regulations), new fuel from Petronas and other minor tweaks to timings etc. 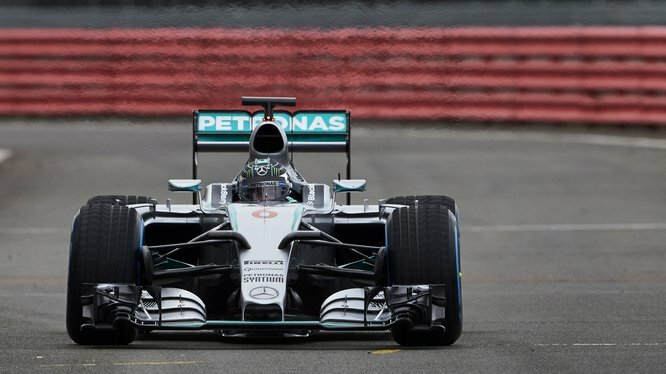 A culmination of all these elements suggests another big year for the Silver Arrows. Afterall, if it ain’t broke don’t fix it. Right? 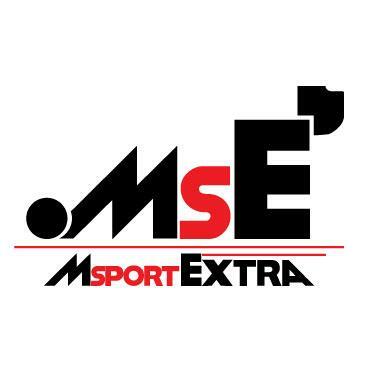 This entry was posted in 2015 Launches, Car Launches and tagged 2015, analysis, car, f1, jerez, launch, mercedes, technical, testing, w06 on February 5, 2015 by thewptformula.